Microsoft officially ended its support for Windows XP on 8 April after over 12 years, forcing the hand of a large number of users to switch to a later version of Windows or another OS all together. However, a sizable portion of XP users are still gambling with their safety but now a registry hack has been discovered which will allow the OS to continue receiving updates. Some organisations, who were unable to migrate their OS onto an updated version before support ended, are still receiving updates from Microsoft by paying the tech giant for the security patches and updates. Meanwhile a simple hack will now make it possible for 'regular' XP users to receive Windows XP security updates for the next five years. First reported by BetaNews, the hack involves changing a few registry settings in XP to trick Windows Update into thinking the OS is Windows Embedded POSReady 2009 and to continue providing updates for it. 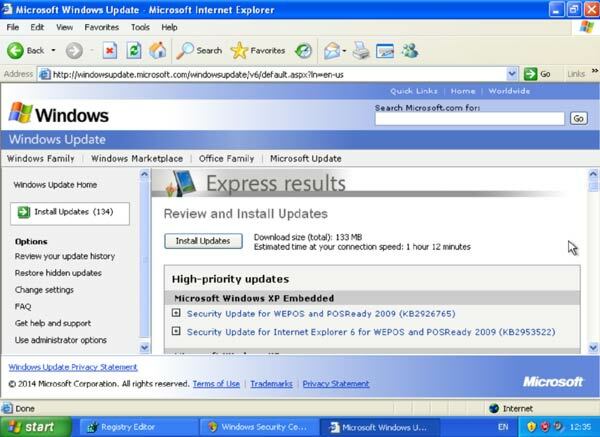 Since the updates for POSReady 2009 are based on Windows XP Service Pack 3, this means that security updates being released for POSReady 2009 are unavoidably the same updates Microsoft would have provided for Windows XP if it was still supporting the OS. Save file as .reg extension and run it by double clicking. Once executed, you will find lots of pending updates in your Windows Action Centre. Since the support for Windows Embedded POSReady 2009 systems aren't scheduled to end for another 5 years, this means that XP users will continue to receive new security updates and patches until 9 April 2019. However, this continued security update doesn't change the fact that Windows XP users could benefit from a more recent version of the OS which will be more secure overall, according to Microsoft. It is also possible that Microsoft could make Windows Update changes to block security updates accessed via the above hack. Yeah I have to agree this sounds like a terrible idea, you might get erroneous updates, missing dependencies or a false sense of security - many components from full XP are probably missing and still unpatched. Well, if you do this, you do it at your own risk. Sounds fair to me.